This was a rapid design challenge I was presented with, to devise a solution within 8 hours. I completed the challenge, and decided to build upon my solution to present high-fidelity wireframes and final design screens. I led the interaction, mobile, and visual design. I conducted market research to gather an understanding of how brokers would benefit the most from using this app. Craigslist, a digital classified ad service, wants to create a mobile app that will make it easier for real estate brokers to post and manage listings using their website. For the initial release, Craigslist wants to target their most active real estate market, New York City. To understand the proper framework for this app, I decided to do some preliminary research by becoming familiar with Craigslist desktop version. It had been a while since I searched for apartments in New York and I remembered feeling overwhelmed and highly stressed during the process. The goal here was to understand the features and search parameters Craigslist currently uses to display its apartment listings. Now that I understood how Craigslist organized its listings, my next step was to focus on understanding the key income generating users for this app: brokers. Research shows that brokers in the area would use the app if it reduced the time it took them to list an apartment and manage responses from prospective tenants. Brokers often plan to list several apartments at a time that vary in location across the city. With each listing, they may receive over 300 responses on average. Thus, they are not only listing and managing multiple apartments across various locations, but also a large amount of responses. This presents a problem with listing efficiency and a pain point with finding an effective and easy way to manage messaging. Using this collected data, I proceeded to flesh out a key user persona for a broker that most likely will use this app. Betty does a lot of repetitive tasks to submit her listings. It can take a long time to get the process going and then due to this disorganization it can be an even greater hassle to manage listing responses. She has a lot of varied locations to submit, and needs a way to keep them organized and easily accessible. Now that I had a fundamental understanding of what may drive Barbara to use one app over another, and her pain points, I proceeded to do some competitive research. During this research, I focused on how each app might alleviate some of Barbara's pain points. I focused on the pros and cons in relation to her persona. Based on the market and user research, the target market of brokers primarily seeks a time-saving way to list and manage listings. Thus, a potential solution for this problem would be to introduce a way to expedite listings, perhaps automating a part of the submission process with auto-fill or batch listing. First, I mapped out the classic user-flow Barbara would have to take to make a listing on a Craigslist app. This is the type of user flow that was typical for most of the competitor apps I researched. The classic way to create a real estate listing is to do it one by one. For Barbara, who has 15 listings in three different areas, this can get repetitive and tedious to do one by one. 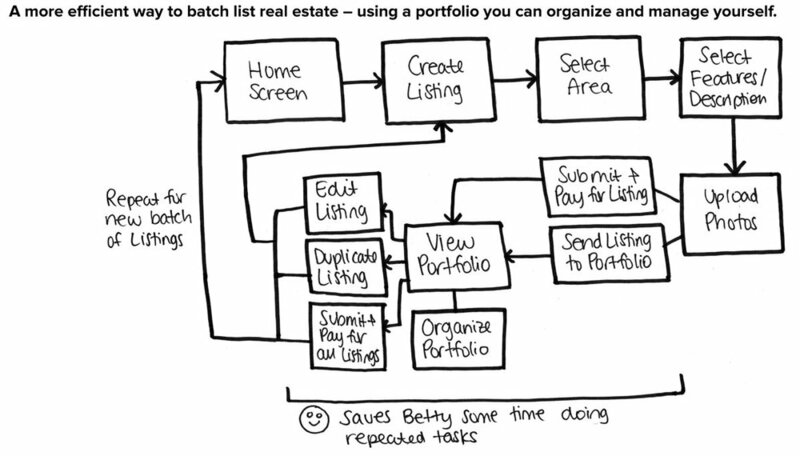 Our proposed way of managing listings saves Betty time from doing repeat tasks. It expedites the process just a little bit, using Autofill and batch processing within a portfolio she can manage and organize herself. Following the sketches, I continued to refine the design with higher fidelity wireframes. In this step, I wanted to specifically refine what the Pending, Portfolio screens and Listing screens would look like. Given that this app would serve as an extension of the Craigslist desktop site, I wanted to extend upon its current branding. This meant keeping the trademark logo icon, violet color, and Times New Roman wordmark. I also wanted to give a nod to the stripped down, minimal and brutalist aesthetic of Craigslist. What makes Craigslist charming is the very lack of design. It is utilitarian, the opposite of flashy, and the app should mirror this vibe - but perhaps a little more upscale. Below are some screens with the final design.